Robert may be $47.90 richer, but he is also one day of work poorer. Here’s the good news: You don’t have to be like Robert — sad, alone, and unproductive. Maybe you’re like Robert. Maybe, like him, you don’t put on real clothes, eat food at strange times and in even stranger combinations — yogurt and pickles, anyone? Maybe you finally start work at 3:30, work until 5:42, and call it a day. Maybe you don’t get a whole lot done and feel bad about it. But here are some tips that can help you become a remote work pro. Most of these tips assume that you are primarily working from home, like some of the famous, creative folks mentioned here. A stable routine is the best gift you can give yourself if you’re working remote. 8:30: Wake up. Fall asleep again. 9:24: Wake up again, this time for good. 9:25: Look at Twitter, Facebook, and Instagram on your phone. 9:43: Read news story or long form article du jour. 10:12: Make coffee, catch up on sports news. 11:18: Look out the window. 11:19: Continue watching NBA highlights. 12:12: Have I been looking at the internet for this long? 12:13: Continue looking at the internet. Do yourself a favor — create a solid routine. Maybe follow this example: Wake up at the same time as a commuting partner or roommate, between 6:00 a.m. and 7:00 a.m. Wake up when your housemate commutes to a real, live office. Start being productive when they get up, pack their lunch, pick out clothes, put on their face, and so on. While they’re doing that, get started on an immersive task or start doing something useful in your own life — go for a run or read the newspaper. Just get going. But why should you get up so early? After all, one of the most valuable benefits of remote work is that it eliminates the need for a commute. Why should you start working as soon as you’re up? Isn’t one of the benefits of remote work the chance to enjoy a languid morning? You might find that you just can’t be productive that way. You might find that if you start your day at a leisurely pace, you will end it in a malaise. Whatever you do in the first two hours of your day could dictate the amount and kind of energy you’ll have left to pursue your goals for the rest of them. Don’t gamble on the contrary. Most of the writers that you look up to were up and working by 9:00 a.m. As always, Bukowski, who got up at noon, is the exception. But he’s imitated all the time and rarely well. Block out time for all of the things you need to do daily in order to be productive. The blank spaces are where you can put specific tasks. Fill out each day in the week, as best as you can, on Monday morning. Every day, also make a list with a set of discrete tasks — that should also include personal business and chores, like going to the drug store, doing the dishes, and doing laundry. If one of those sundry personal tasks is going to take you longer than twenty minutes or so, you should block out time for it during the day on your calendar. Your day plan shouldn’t be gospel — sometimes you’ll check your messages at 11:30 a.m., or eat lunch at 1:00 p.m. The goal of this day plan is to reduce stress, so don’t sweat it if you have to spend a little more time answering emails than you thought. This is an old idea that you’ve probably heard before: Ben Franklin used this system. If you don’t have an office in your home, you’ll find that your work and your home life start to bleed together. Start and end your work day in your office. That will help you separate work time from home time and vice versa. Think of that separation like sleep hygiene. If you follow those guidelines, you’ll set up a mental pattern around work and dedicate space to it. That will help you get focused at the right time and leave work “at the office” when it’s done. Your home office doesn’t need to be fancy. You’ll need to spend some money to do it right, but your employer might be able to reimburse you. You can also write off the cost of rent or mortgage for a home office, plus any equipment or supplies, on your personal taxes. A nice chair: This is so, so important. Invest in an ergonomic swivel chair, and your back will be much happier. A chair is worth splurging on, but there are bargains. You can buy your nice chair used or on consignment. A desk: Pretty straightforward. This doesn’t have to be fancy. Use an old folding table or something — just make sure that your arms will sit at a comfortable angle, and you can fit everything you need on it. Lighting: I have a desk lamp, a floor lamp, two overhead lamps, and a window. You’ll want to be able to adjust the light: bright and airy in the afternoon and warm, yellow light in the evening. Computer monitor: A second screen will change your life if you haven’t used it. With a second screen, you’ll be able to keep a page open while you’re writing about or referring to it on the other. You might also feel like you’re doing something exciting and technical, like flying a plane or spaceship. Other computer accessories: A mouse, keyboard, speakers, and so on. They’re better for your arms and wrists than trackpads and tiny laptop keyboards. On that note — invest in some wrist pads. Decor: Make your workplace pleasant! Get pictures of your partner, family, and friends. Put up pictures of people and art that inspire you. Get a plant. 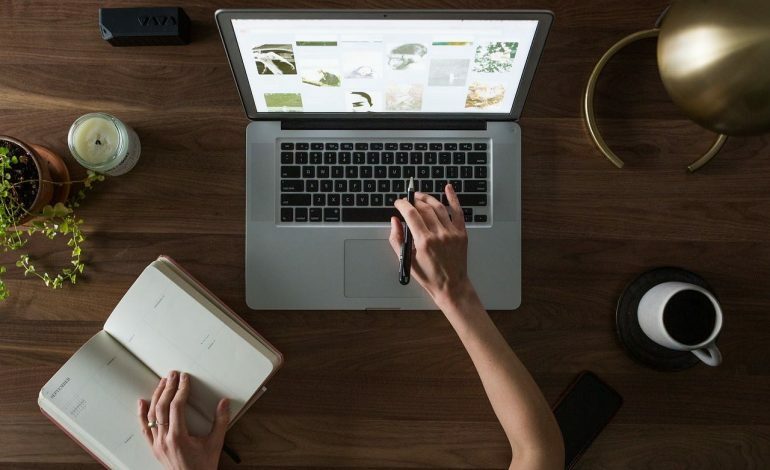 Your couch, kitchen counter, and dining table are not substitutes for a real workplace — you’ll understand after you set up a useful home office. All the above said, you should work in places besides your office. Your couch, kitchen counter, and dining table can supplement your workplace, even if they can’t replace it. Take a break from your office in the early afternoon. Since you can’t see and talk to your colleagues when you’re remote, like you would when you’re on site, your brain might get bored by the quiet and sameness of your office. You could get sleepy or distracted. In the afternoon, work at your kitchen table or on the couch. The change in location — and posture — will help you stay fresh as the day stretches on. 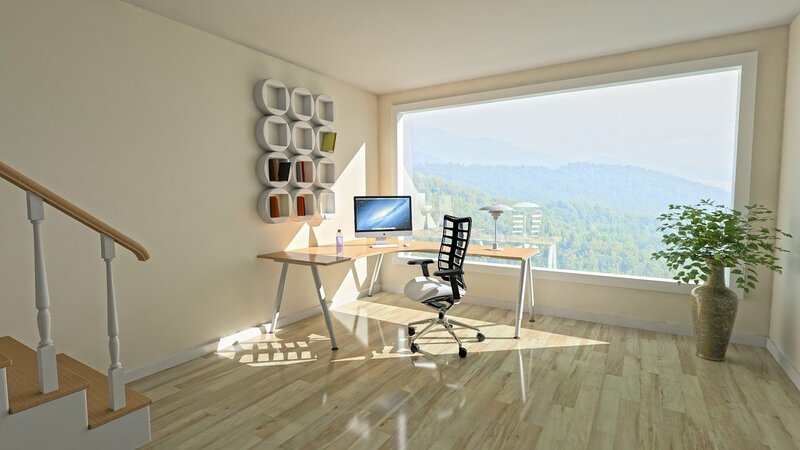 Try to follow the sunlight around your home: Natural light makes humans healthier and probably more productive. When the sun goes down, if you’re still at it, you can return to your office in order to take advantage of the lighting setup that you’ve perfected. Frequent, well-managed breaks can boost your productivity. That’s especially true if you’re focused on a task that requires long periods of concentration. Essentially, he’s saying you can’t sit down and write “The Waste Land,” which you already knew. You have to live and see a little before you write it. Eliot was saying that inspiration is a myth — creativity and accomplishment don’t come out of thin air. They come after you see or think of something, and your mind lets it germinate before finally digesting it. You need to give your mind a rest. So, what does this advice do for you, who is not a writer? You’re writing emails, creating a deck (hi, Robert), or invoicing a vendors. This silly, creative stuff might not be for you: You’re not a poet or inventor. But really, it’s for everyone. We all waste work hours by going down internet wormholes about sports/celebrity gossip/comedy clips/vacation ideas. When you feel that wormhole urge, stand up and walk around your home. Come back in 10 to 20 minutes. You’ll get a lot more done. Any coffee shop in any neighborhood in the United States is full of people hunched over their laptops. Until you work from home, you might wonder about the utility of working in a place that isn’t your office and isn’t your home. But getting out of the house can be really helpful. It’s the turbocharged version of moving around your house during the course of your workday. The change of scenery can be helpful for stimulating your mind and keeping you awake. Still, coffee shops have disadvantages. For one, they’re not meant to be workspaces for creatives and professionals. That function is pretty new, and the best coffee shops are full of people meeting up to have a meeting or conversation. Plus, the sounds of coffee grinders and steam wands are loud and obnoxious. A barista’s music choice can be good on an aesthetic level, but bad as a work aid: I like to listen to Slayer every once in a while, but not while I’m working on a white paper. That’s the reason why coworking spaces are sprouting up all over the place. 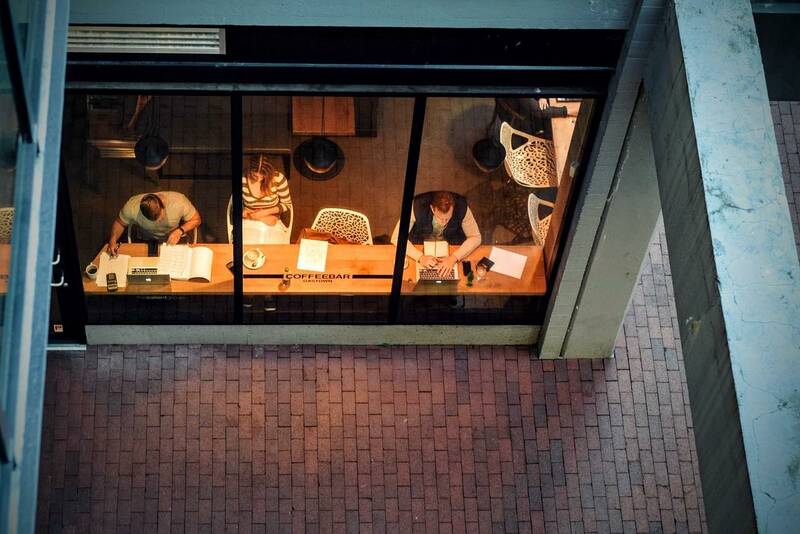 Coworking spaces are places that are actually meant to be workplaces, unlike coffee shops. They’re real offices, and good ones have a convivial atmosphere. You can network and make real friendships at them. Exercise shows up in every post that promises to increase your productivity, and it’s probably the most reviled item. Even if you’re not an athlete or a health nut, you might find that exercise is essential for every day that you work at home. I just can’t focus all that well unless I work out in the morning. Working out early on is really helpful: I’m more energized and more focused on days that I work out than on days when I don’t. Getting up an extra half-hour early is worth the struggle. Like Jefferson, I like to take my walks in the afternoon. (This is the only way in which I will compare myself to Thomas Jefferson.) It clears my head and wakes me up, which is useful after a substantial lunch. Conversation is in short supply when you work remotely, which is a blessing and a curse. On the one hand, you won’t have colleagues interrupt you when you’re in your zone. That’s really helpful if you’re trying to get through a thorny project and you really need to focus. On the other hand, you won’t have colleagues interrupt you when you’re in your zone. You won’t be able to take a break and laugh about their weekend hijinks while you’re trying to get through a thorny project and need a momentary distraction. There are a few ways to get that social contact during your day. Maybe talk to your partner around lunchtime. You can talk about serious stuff, like that thorny project, or you might talk about the cat or what you’re going to eat for lunch. I also like to walk down to the coffee shop around the corner when I’m taking a mental break. The baristas know me by name, and it’s nice to chat for a few minutes before I get back to it. You can also set up a daily check-in with your boss or teammate. Think about checking in with your boss every day at the same time when you go remote. Even if you don’t do it forever, you’ll find that the check-in will help you stay accountable and let your manager know what to expect on the next workday. Find some way to have a conversation if you’re working remote full-time — talk to your best friend, your mom, your spouse, your neighborhood barista — sometime during the course of your day. That way, you won’t start talking to your potted plant. But of course it’s okay to do that if you have to. Team communication and project management software, like Slack and Basecamp, will help you feel connected to your office. Basecamp, for example, has a number of chat rooms where users can talk about projects. Your team can even set up a catch-all room where the team can trade jokes and memes. Plus, most chat apps have direct messaging features that allow users to get in touch with other team members directly. Direct messaging is a helpful tool if you have a quick question that doesn’t require a full, more formal email — “Hey, what Dropbox folder is that file in?” — or if you want to pass on a funny link. However, chat is even more distracting than email. You know this to be true already. Think about how much time you spend texting, rather than writing emails. That’s because texting is much more fun than emailing. Chat is the same way. 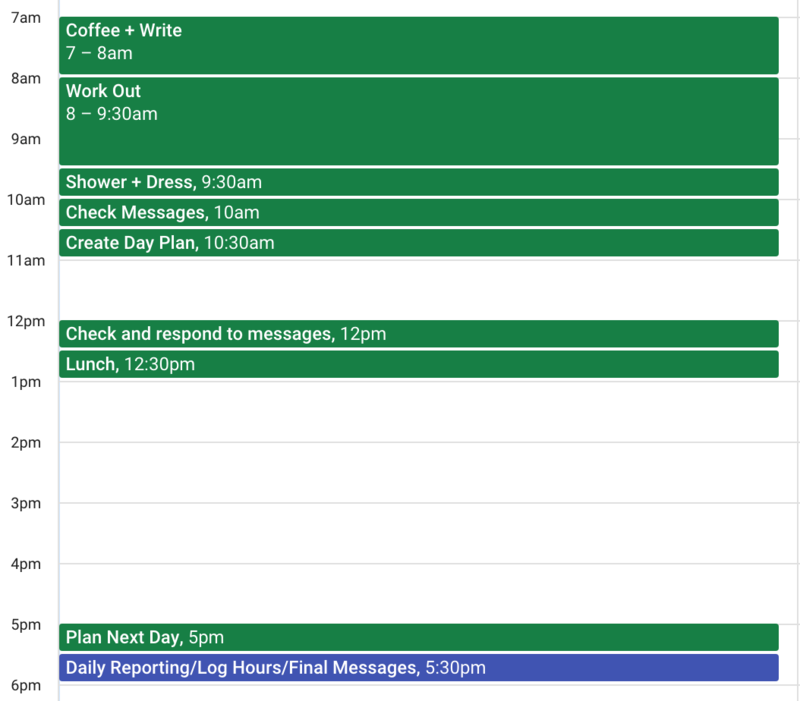 So, if you really need to get in the zone, and your team uses chat, you should let everyone know that you will be out during the amount of time you’ve blocked out in your super-detailed daily plan. Eating out of your own pantry is a delight at first. Nobody will see you if you eat ice cream at 11:00 a.m. It’s very novel the first few times you do it. But by the time you’ve gotten into the habit of eating a pint of ice cream every day, you might start to have some regrets. 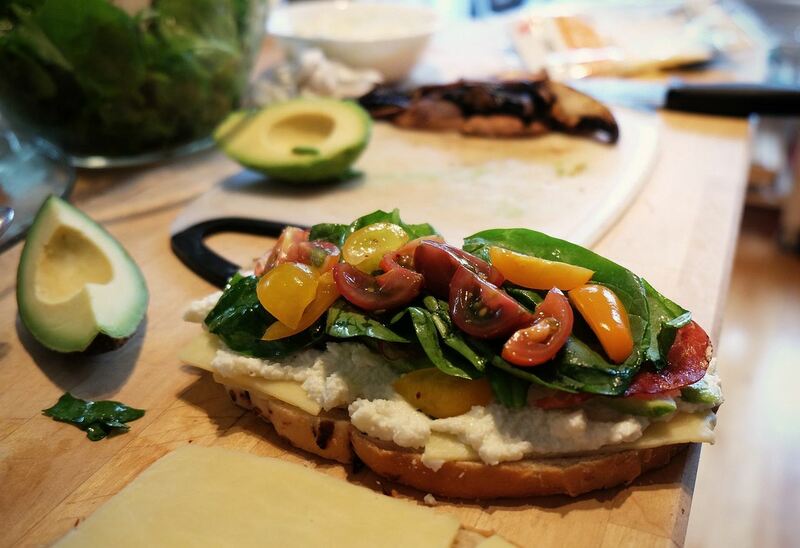 When you work at home, try to eat normally — eat real food, as real meals, at normal times. If you can do that, you’ll help yourself keep a normal schedule. And you can avoid that sleepy lunchtime feeling. Your diet in remote work is like any other part of your remote work life: You’ll have to set good habits and follow them. That can seem like a daunting challenge at home. But if you can set limits and develop good habits, you’ll find that your work-life balance is better than ever. Peter Johnson is a writer and reporter from Seattle. He contributes journalism to local and national publications. He also works as a copywriter and content strategist, and writes fiction. When he’s not typing, Peter plays drums in a rock and roll band, and hangs out with his wife and cat in South Seattle.